The Lynnville-Sully boys maintained their perfect 14-0 conference record with a couple of wins last week. The week started on the road at Colfax-Mingo where the Hawks earned a hard-fought 65-57 victory. L-S came out and scored a quick 21 points in the first quarter and held C-M to just 10. However, the Tigerhawks fought back and kept the Hawks on their toes. Going into half-time, the Hawks were only up 34-30. 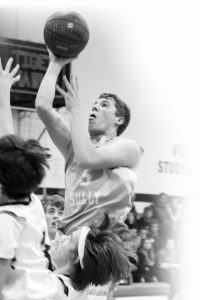 The third quarter was back and forth, and in the fourth quarter, L-S pulled away just enough to escape with a victory and undefeated SICL record. Senior Jesse Van Wyk uses his ups to get a shot off over the extended arms of his Colfax-Mingo opponent. The Hawks hit a lot of shots and had three guys score over 10. The Hawks shot 43 percent on the night, making 23 of their 54 shots. L-S made only six of 25 threes, but they shot 68 percent from the free-throw line, making 13 of 19. Senior Tanner Foster had 16 points and junior Rylan James had 15. Van Wyk had 13 points. Senior Brevin Hansen and junior Tyson Vander Linden had nine points each. Hansen led the team in rebounds with eight. James and Van Wyk had seven a piece. Hansen and Vander Linden each had five assists. Hansen collected four steals on the night. Later in the week, the boys were on the road again, this time to Victor to take on the Warriors of HLV on Friday. The Warriors entered the game with a 6-9 record and were looking to end their five-game losing streak. At first it looked as though they would have a good chance at hanging around as the first quarter ended with a 15-13 score in the Hawks’ favor. From there, the Hawks took control of the game and won by a score of 83-53. The Hawks moved to 14-3 on the season. 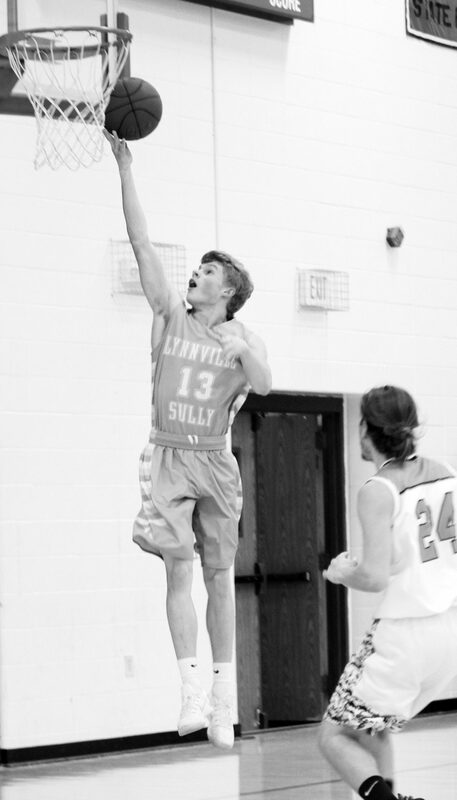 Unguarded junior Tyson Vander Linden puts up two points at HLV last Friday.